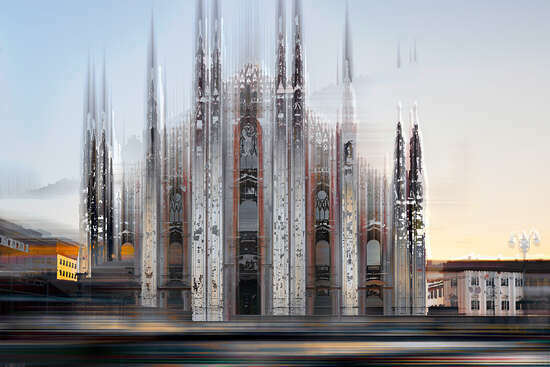 London, Paris, Rome, Berlin – Sabine Wild toured Europe’s major cities armed with a camera, ready to transform monuments and skylines in her very special way. 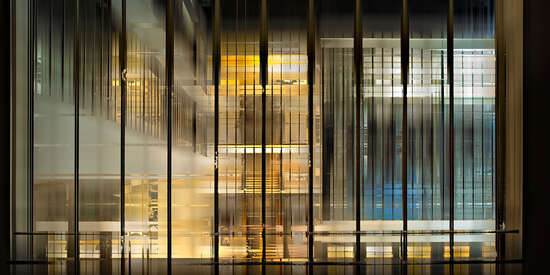 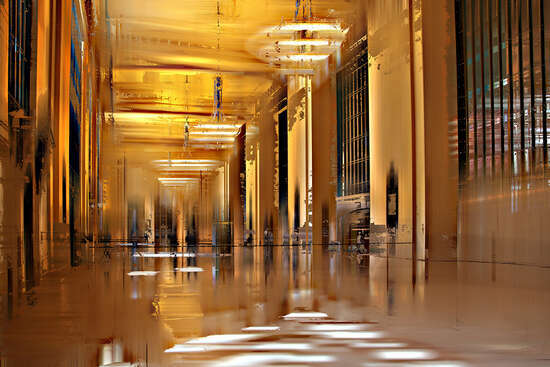 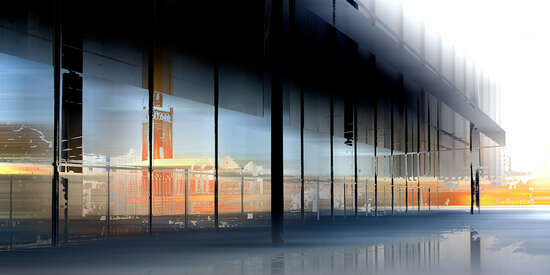 Her architectural images are works of art composed of structures and light. 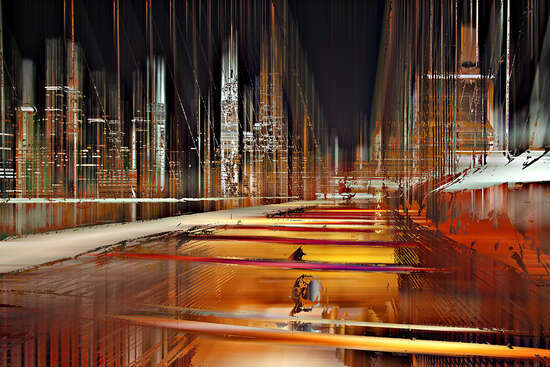 Wild captures the world in lines. 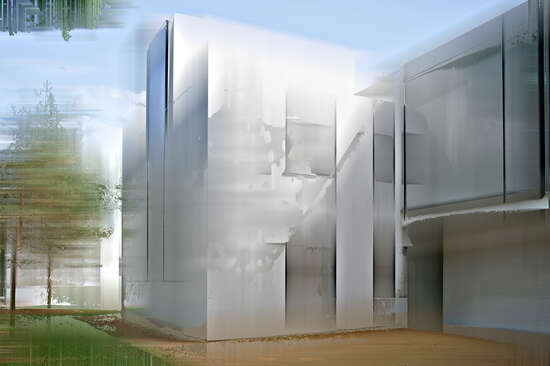 Her typical vertical and horizontal hatching creates a flickering structure. 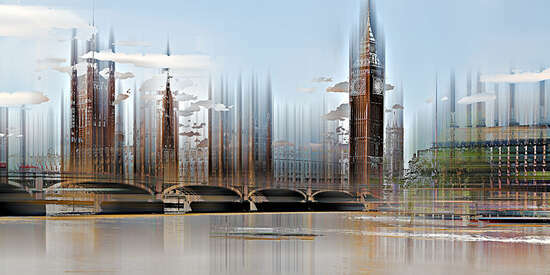 A fascinating picture in which only hints of the underlying reality remain. 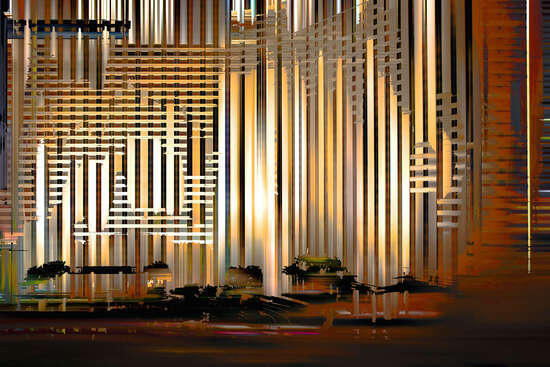 Thanks to Sabine Wild, the Römer in Frankfurt seems like a gothic convention of lights. 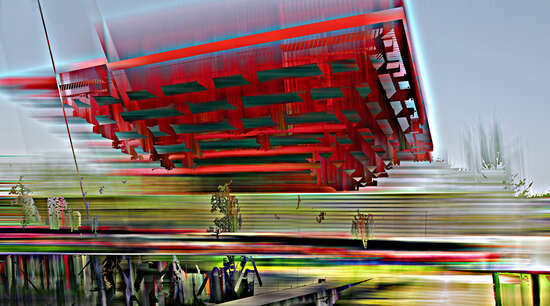 At the same time, it is not a picture that gives off a feeling of medieval confinement; bright and fresh colours dominate. 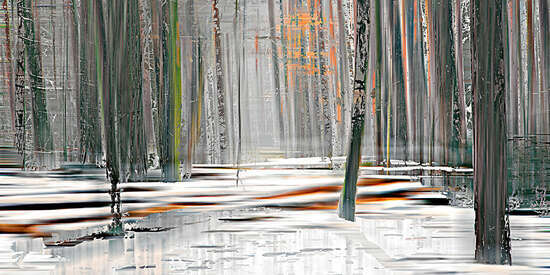 In the Sachenshäuser Ufer, the artist brings a natural element into her normally very abstract visual language. 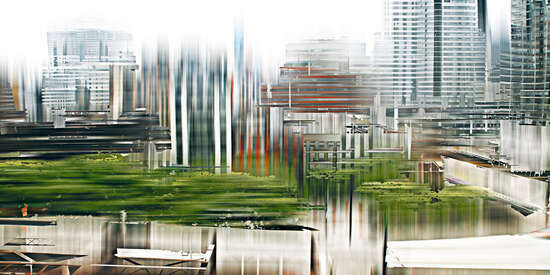 Arising from the “real” cityscape, the wintry boughs are naturally formed shapes that do not want to assimilate into the horizontal lines of the river or the verticals lines of the Frankfurt skyline. 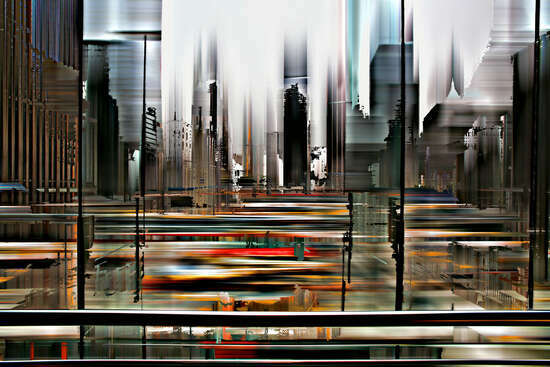 In this way, Wild’s art creates an exciting contrast between art and reality, between alienation and naturalness. 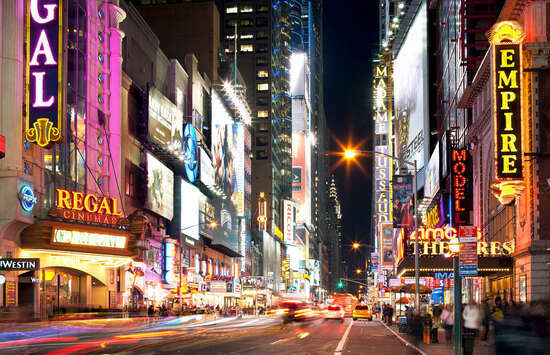 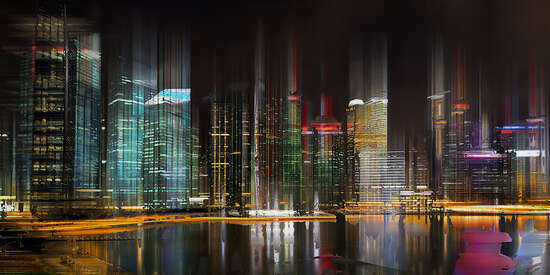 In New York Projections and Asian Projections, Sabine Wild discovers the beauty of the night, which experiences a special appeal in cities full of artificial lights. 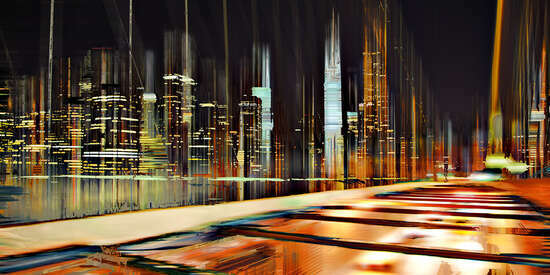 The lit-up buildings, streetlights, and headlights serve as creative material for the artist’s urban compositions. 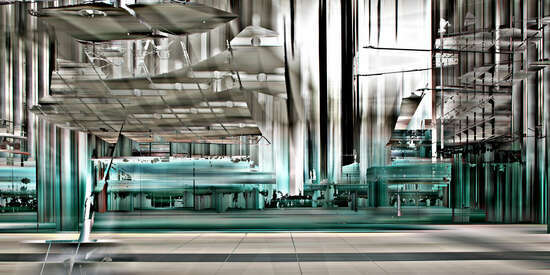 Luminous batches of colour break through the graphical austerity that Wild otherwise consistently sticks to. 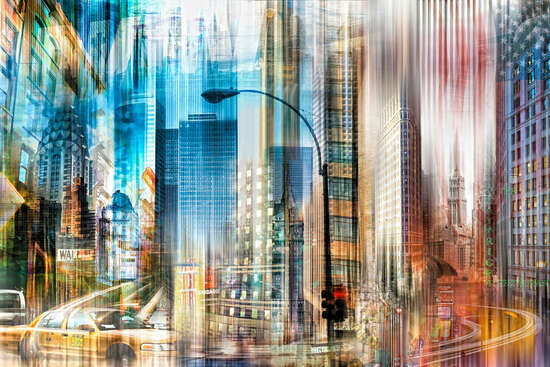 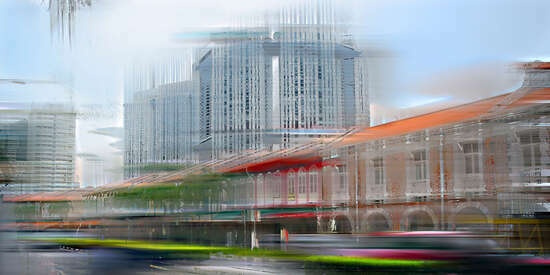 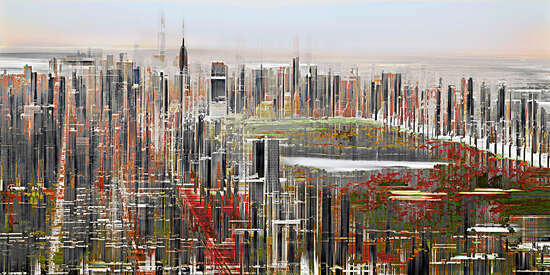 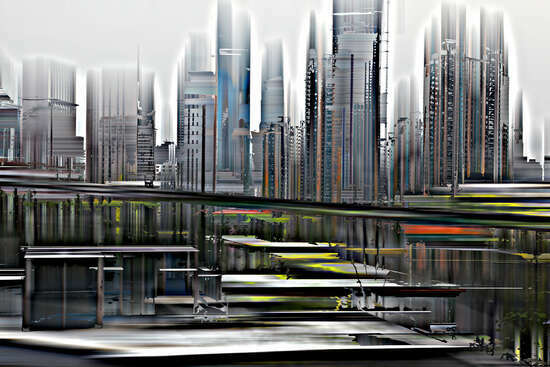 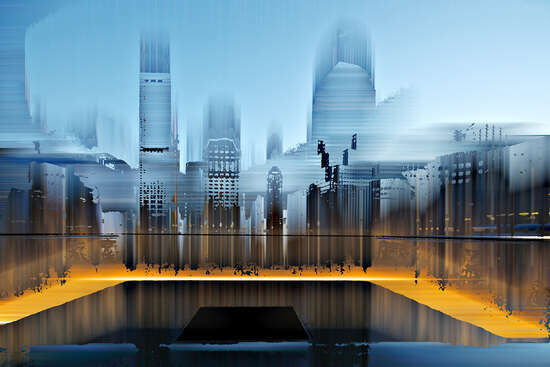 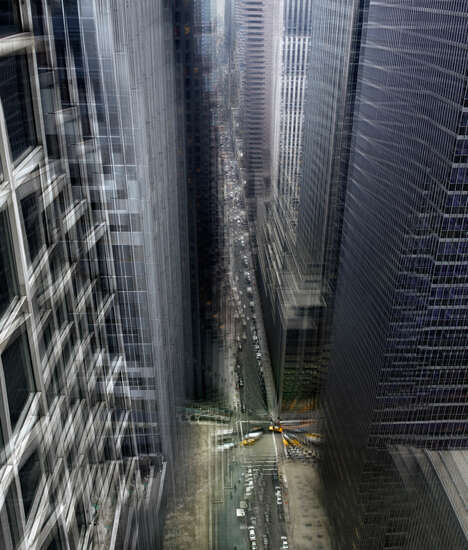 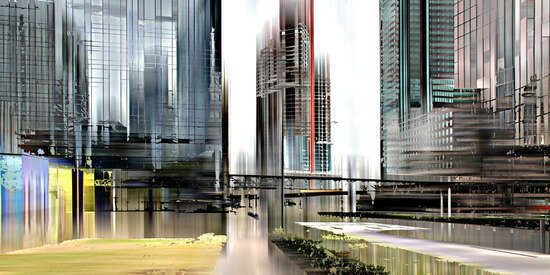 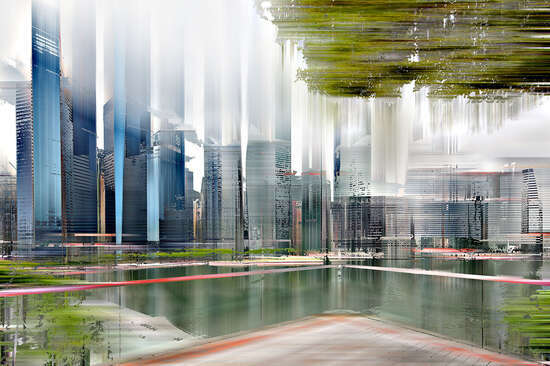 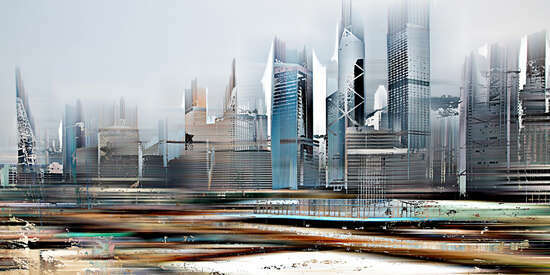 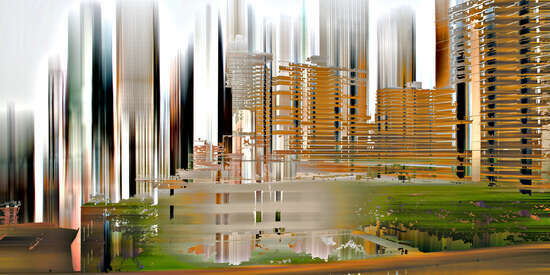 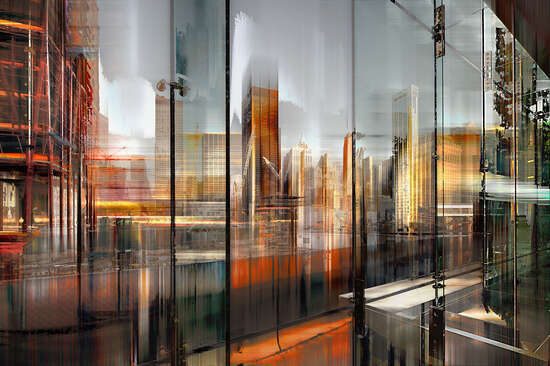 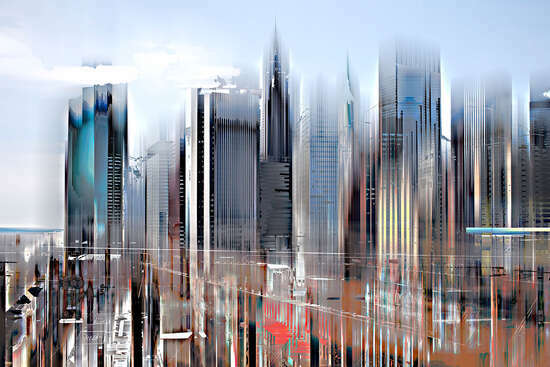 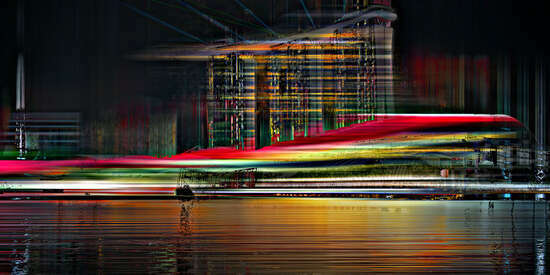 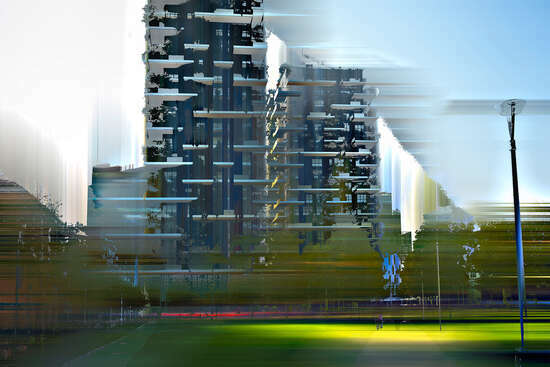 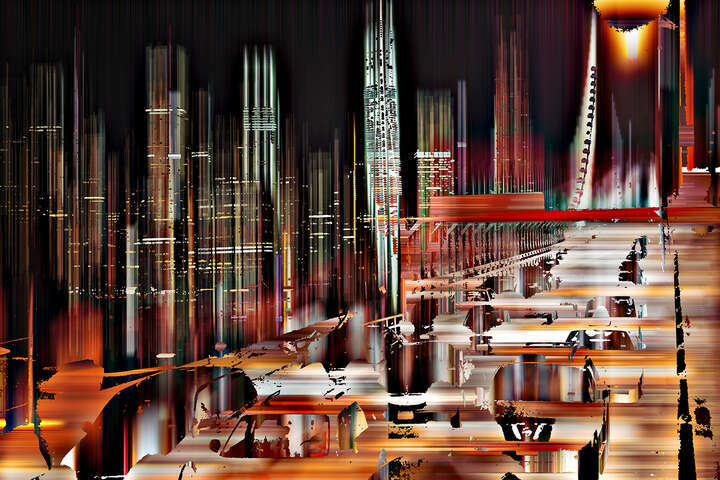 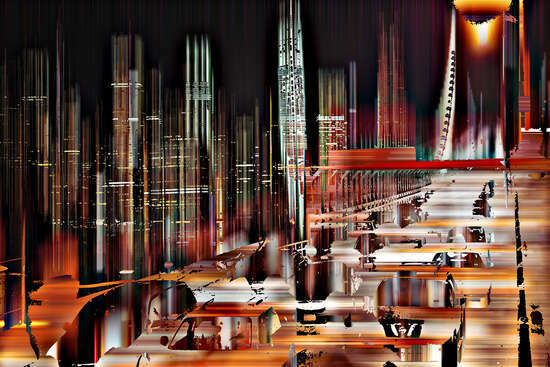 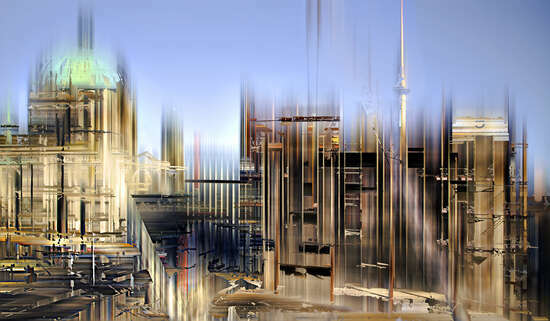 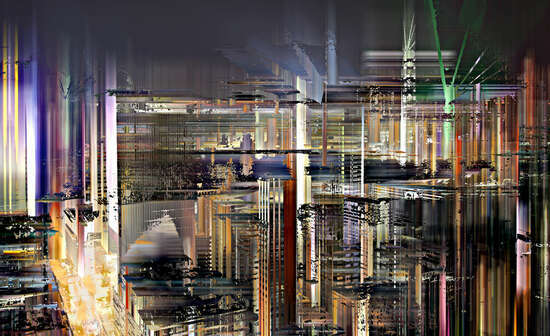 The famous skylines of New York, Hong Kong, and Shanghai appear as if painted: Action Painting 2.0. 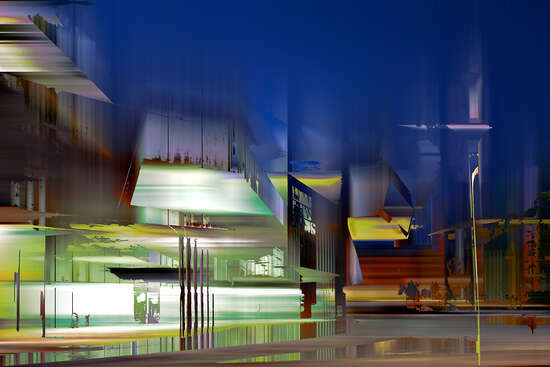 Sabine Wild has further developed her vertical-line visual language and discovered the digital means for creating her work. 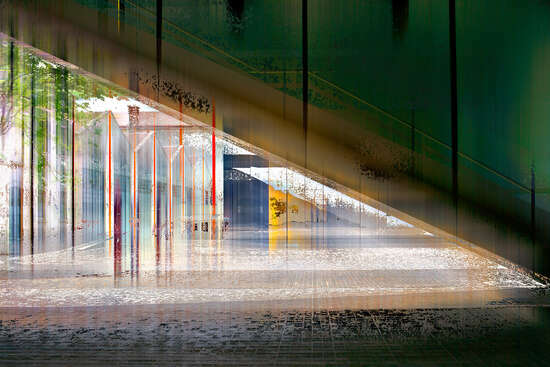 In post-processing, she designs her thrilling compositions – dark horizontal and vertical lines stand by powerful colours, painterly passages by graphical areas. 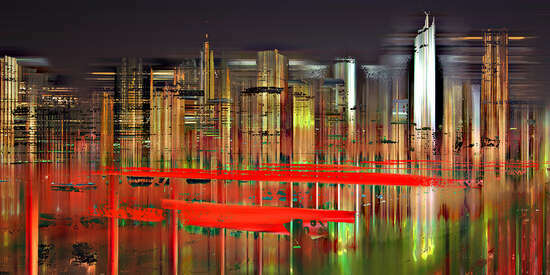 As in painting, the energetic way the colour is applied determines the effect the image has. 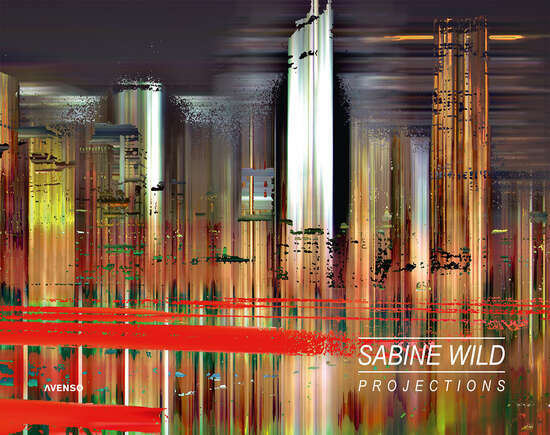 Sabine Wild reveals a new, impressive look at the world and its architecture. 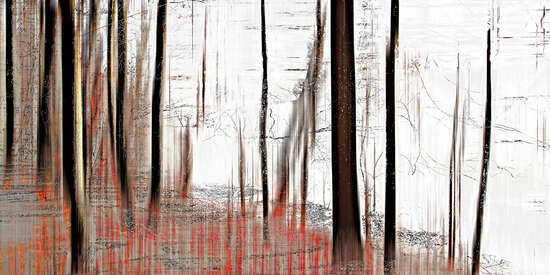 In her Woods series, Sabine Wild takes her painterly means of expression into the abstract. 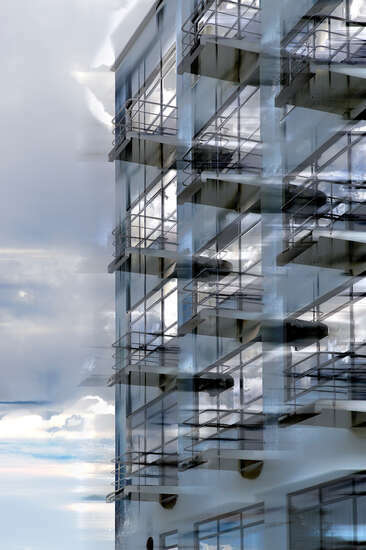 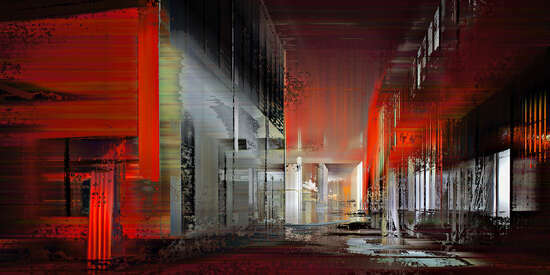 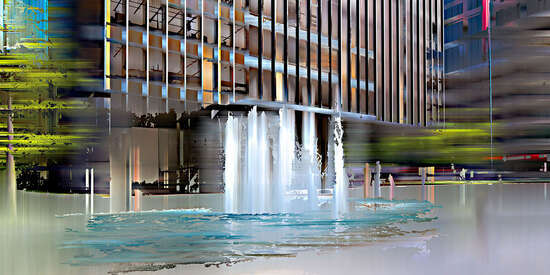 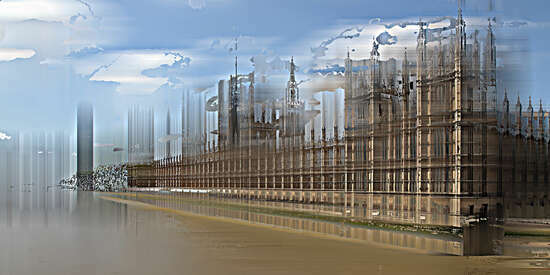 While her architectural images give an impression of reality, here, she dissolves it into shapes and lines. 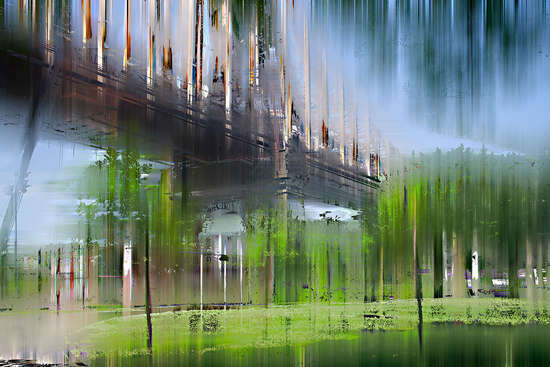 The longer one’s gaze rests on the picture, the more the lines transform back into trees. 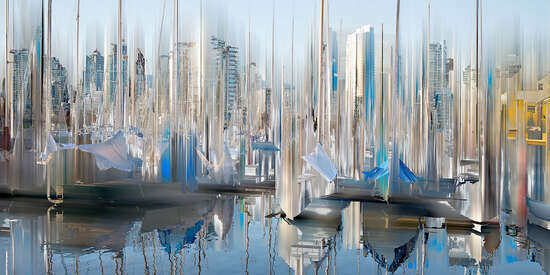 It is not sorcery but the unique art of Sabine Wild. 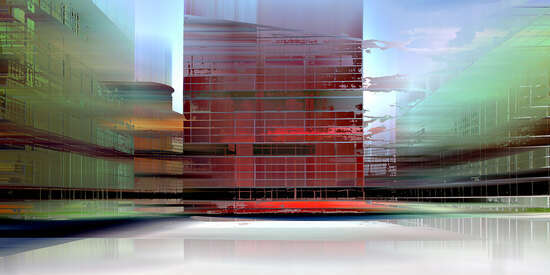 The composition quotes her architectural work. 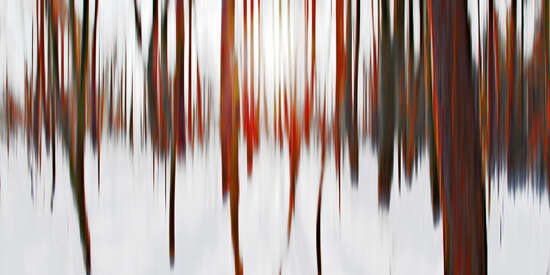 Lakefronts and bogs lie peacefully in the horizontal lines. 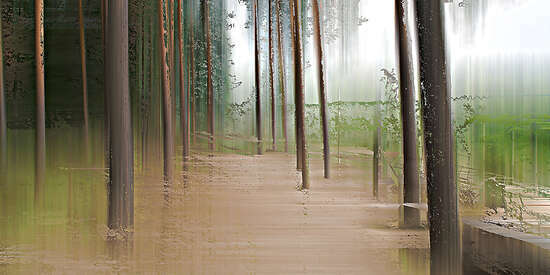 Tall trees rise into strong vertical lines. 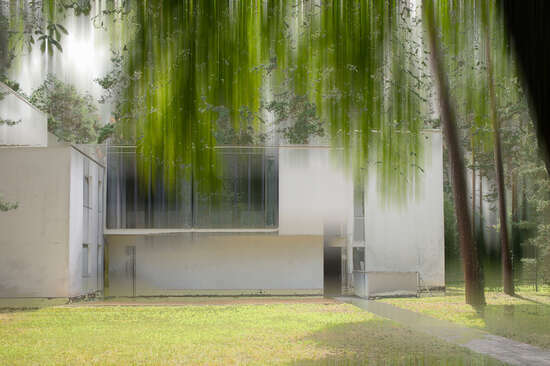 In between, their boughs refine the surrounding space. 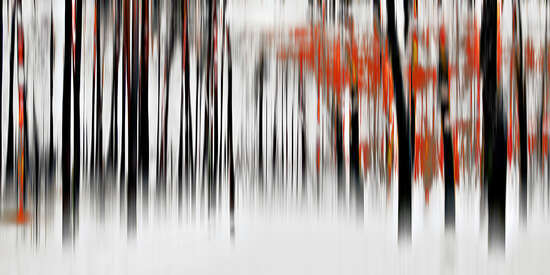 Sometimes Wild leaves the subtleties of tree bark plainly recognisable, and sometimes she obscures them with superimposed lines. 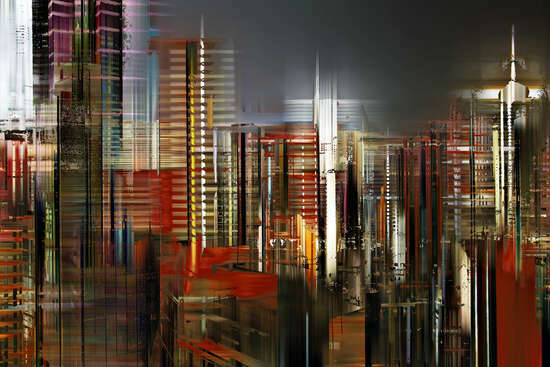 Sabine Wild subtly brings diverse structures and our big cities’ hidden dynamics to light. 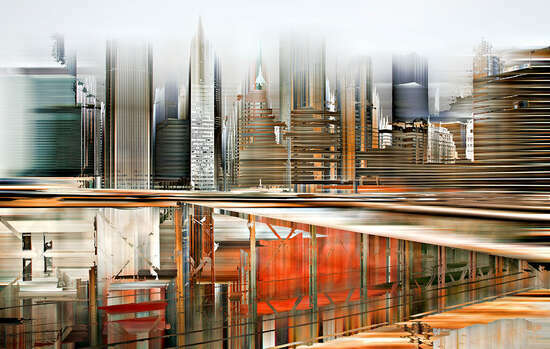 She elegantly and uniquely deconstructs urban architecture. 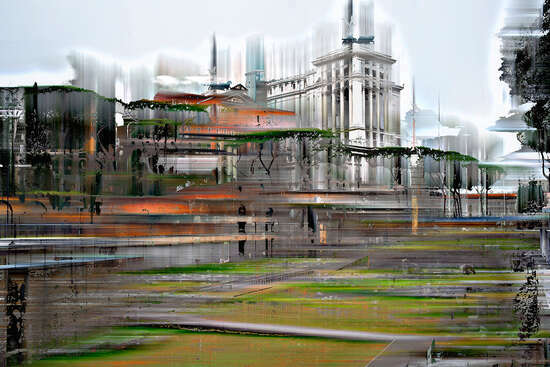 Through the digital blurring, her photographic work takes on emphatic aspects of painting. 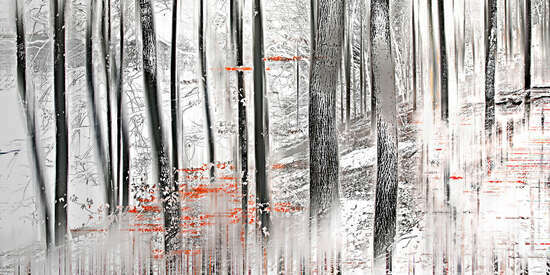 This new art form, which Wild unquestionably created, is most clearly recognisable in her Woods series, in which she masterfully employs gestural painting and artistic photography. 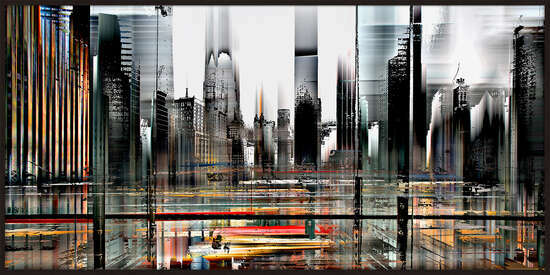 Born in Italy in 1962, the artist now lives and works in Berlin, Germany. 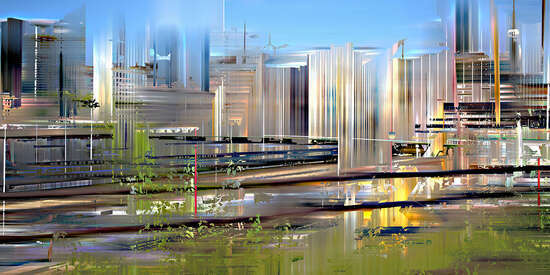 In her work, Sabine Wild captures landscapes and architecture in patterns of lines, shapes, and colours. 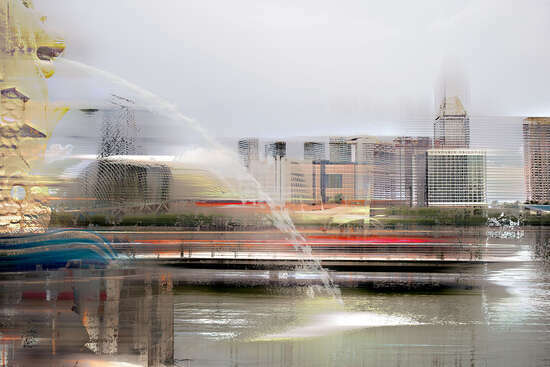 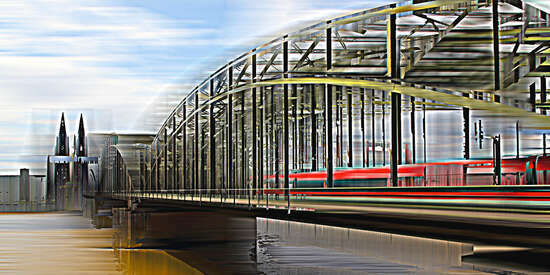 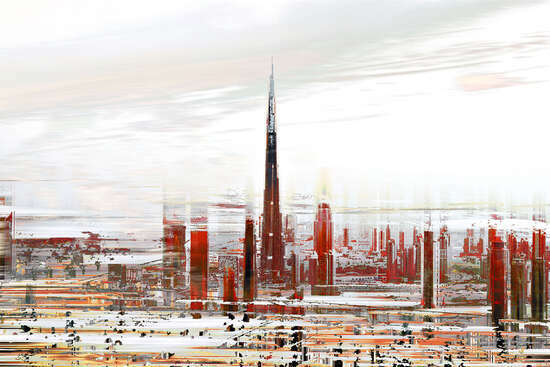 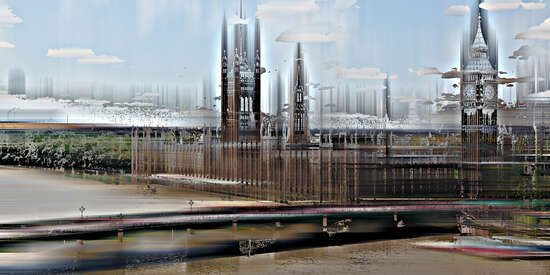 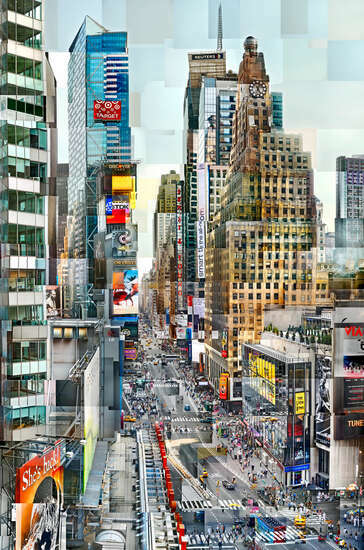 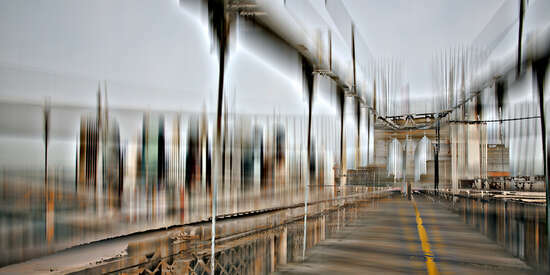 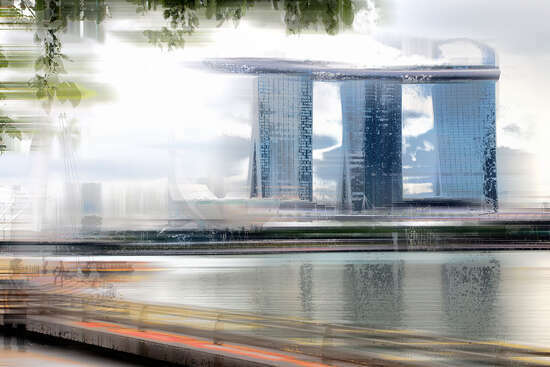 She translates the swift movements and fast pace of the cities into pictures that can be read in a second. 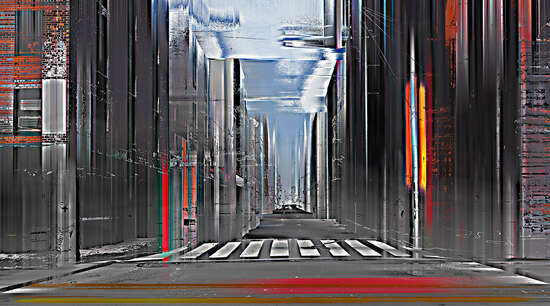 Her photographs settle into the realm somewhere between mirage and reality. 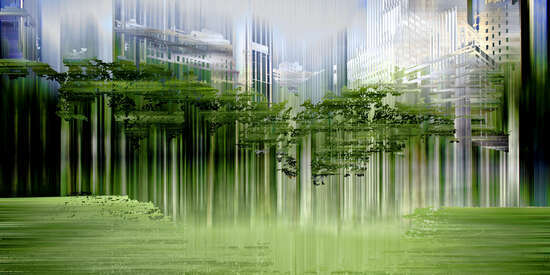 The forest compositions almost seem like an alternative draft of the urban works. 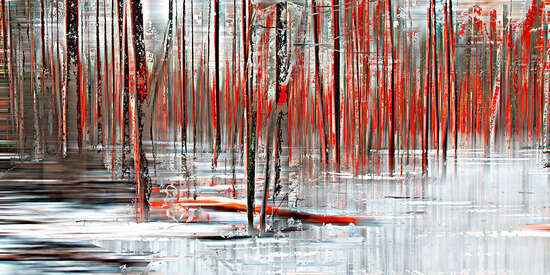 In different levels of abstraction, she captures the moods of the seasons: the stillness of a winter day between the thin trunks, or the spring green, next to which those out for a stroll appear like dabs of colour. 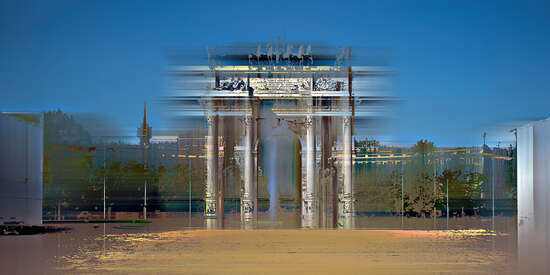 That which Sabine Wild develops through formal resolutions and impressionistic dissolutions is emotional and intoxicating. 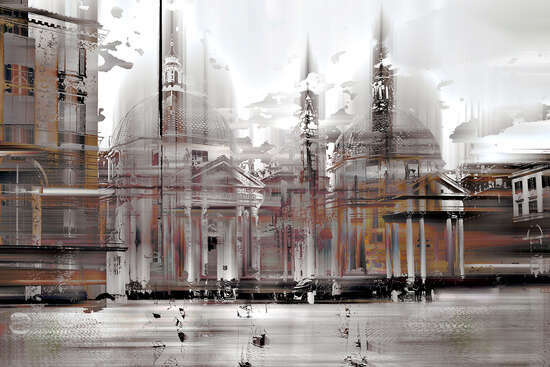 Sabine Wild was born in 1962 in Padua, Italy. 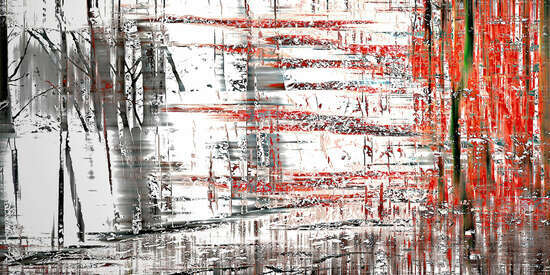 Her art has appeared in numerous solo and group exhibitions across Europe and Asia. 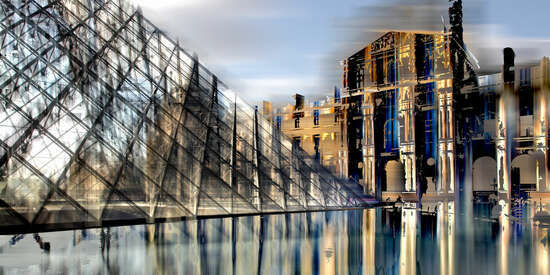 In 2005, she co-founded the Berlin Gallery en passant, which has since been renamed ep.contemporary. 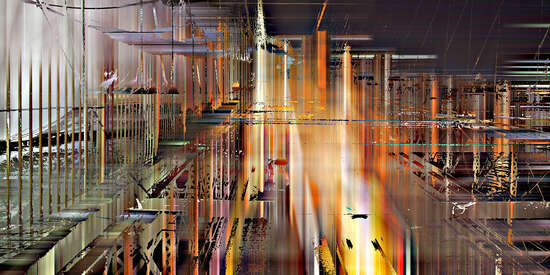 Starting in 2008, she has organized an annual studio crawl in Berlin called Südwestpassage Kultour. 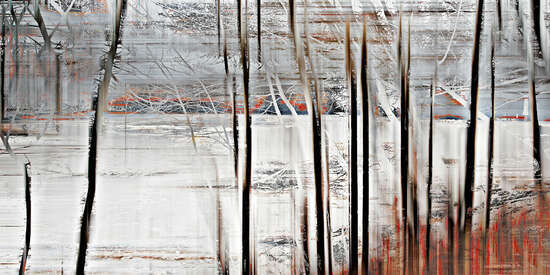 Her work can be found in many public and private collections. 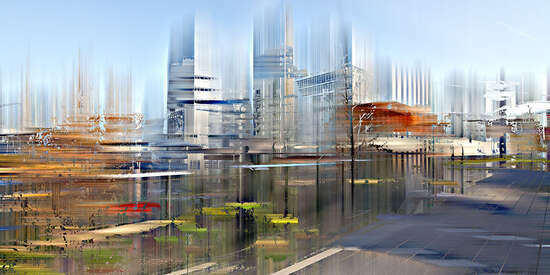 Sabine Wild has been living and working in Berlin since 1985.